Without much ado, let us present you with tips on sharing data on social networking sites like Orkut, LinkedIn, Twitter, Facebook, MySpace and others. The first step is to understand the social networking platforms’ terms and conditions regarding sharing data online. Almost all social networking sites like Facebook and Twitter have strong policies governing the sharing of various types of data, including images and videos. It is important to go through this information and to follow it, in order to be on the safe side. More often than not, people accept the ToS without actually going through the details, not realizing the risks they may be exposed to. The best practice is to clearly understand the policies and follow them as closely as possible. These policies are prepared keeping in mind the users’ best interests. Some may find them unjustified and worthless; however, in most cases they have proven to be beneficial. Almost all social networking sites have privacy protection tools that the users need to be aware of. Facebook, for example, has extensive information on user privacy. The social networking site allows users to decide how the information is shared. The website allows users to choose who can view and comment on status.es, images and videos. Additionally, the tagging option found on Facebook should also be paid attention to as a tag may make your image or status open for the general public to see. Quite often, websites change their privacy settings that are updated by default. It is important to be in touch with the happenings and make changes accordingly. In addition to Facebook, other social networking sites such as Orkut and Twitter also have their own privacy tools. 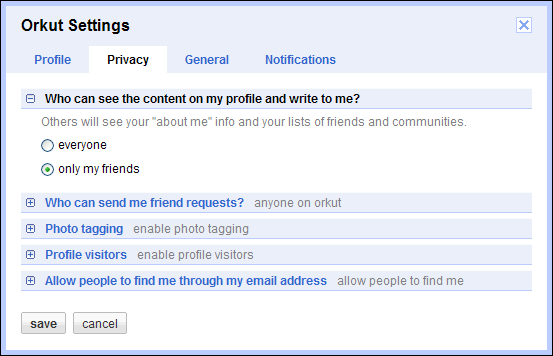 For example: You can select who can view your scrapbook on Orkut from the privacy settings option. It is very important to be clear about these two points. As mentioned above, quite often, our images and videos become public without us knowing about it. For example: All the images on the Facebook cover photos are public. This means that anyone can view and download these images in high quality. Facebook currently does not offer privacy in this regard. To be on the safe side, you should not upload personal images as cover pictures. If you wish to share such images, you can make a new album and use customized privacy settings in it. In the same way, Twitter also offers privacy regarding who may be able to follow you and get access to your updates. It is very important to be aware of who can see your information. Most social networking sites offer customized options in this regard that allow users to control their data in a better way. These are some of the most important tips about the use of social networking sites. In case your files are extremely personal and may cause some sort of damage, it is suggested that you do not share such information via open platforms. You may use e-mails or personal messaging service for such matters so that the risk of the information reaching the wrong hands is minimized.